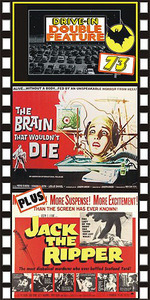 THE BRAIN THAT WOULDN'T DIE (1959) Herb Evers, Virginia Leith, Leslie Daniels, Marilyn Hanold. UNCUT! Ludicrous sleazy schlock at its absolute best. A severed head, a gross looking monster, two battling strippers, a mad scientist…all blended together in an unbelievable way. This could be the single greatest piece of drive-in celluloid ever made. A crazed scientist keeps his decapitated fiancée’s head alive in a pan full of strange solutions. Look out for the cone-headed monster in the closet. Other pre-records of this are drastically cut! One of our all time favorites. From 16mm. Plus: JACK THE RIPPER (1959) Lee Paterson, Eddie Byrne, Ewen Solon. The best film about the English madman. “Jack” commits a series of gruesome slayings in an effort to wipe out prostitution from the streets of London. Brutal and sadistic for its time with the famed 'color' sequence at the film’s climax. "Are you Mary Clark?" A well-acted, solid British chiller. From 16mm.